Good-bye boring animations and graphics! The new ancient-battle-themed slot, Spartania now available at GR88 Casino raises the bar for graphics and effects with its amazing three dimensional illustration. Take it for a spin soon, while you can get some free cash to try it! Until January 31, get a deposit bonus up to $100. 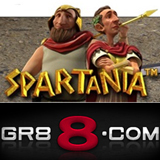 To claim the 20% Spartania Deposit Bonus enter coupon code SPARTANIA20 when you deposit. You can bet from a penny to a nickel per line for a max bet of $7.50. Bonuses and wild spins hidden throughout the game take them into a beautifully animated bonus round. Three or more Queen symbols trigger another bonus feature where the Spartan hero sits at a table piled with money and players choose a gold coin to reveal prizes. A gauge at the top of the screen indicates the random multiplier for that spin: 1X, 2X, 3X, 4X or 5X. Spartania’s Wild symbol is a Sword & Shield that expands to cover the entire reel it’s on. If you're a battle-ready history buff you'll also enjoy GR88’s other Ancient Games slots: 300 Shields, Call of the Colosseum and Stash of the Titans. GR88’s New Years Resolution Bonuses continue until the end of the month. Players are choosing resolutions and receiving up to 100% bonuses. Pick your resolutions and unlock your bonus until January 31.